The R-200VPC is totally programmable, allowing for absolute coating consistency, more efficient operation and significantly increased production and profits. 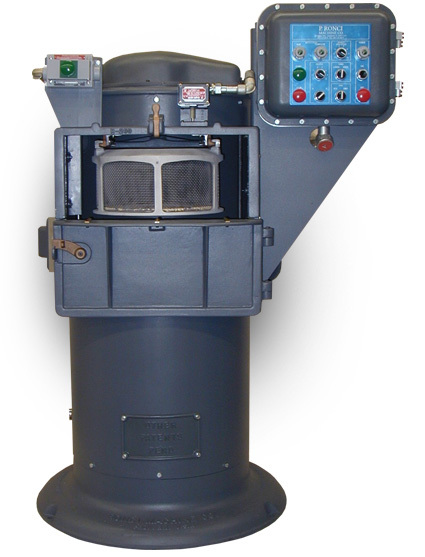 For instance, the R-200VPC dip spin machine can easily coat 11,000 pounds of standard fasteners in an eight hour day with just one operator - accounting for 20-50% greater capacity than a manually run R-200V when using one operator. Also, the automated operation is completely hands off from the moment the basket is locked in place until the cycle is finished. An 8-speed spin motor control is standard equipment on the R-200VPC. Shown above with the R-200 Conveyor-Dumper. 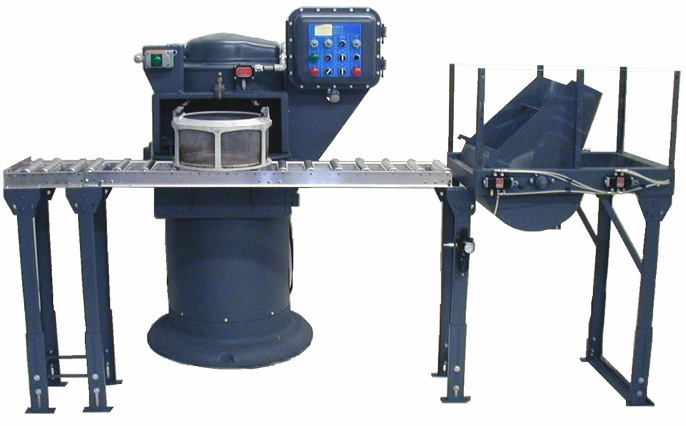 A unique add-on that allows the operator to manually slide the basket from the coating machine onto the conveyer and into the dumper cradle. The R-200VPC allows you to bulk coat with solid film lubricants, lacquers, enamels, waxes, liquid lubricants and adhesives to your exact specifications by storing 16 different timed dip-spin procedures. Also capable of slow spinning your parts while partially immersed in the coating solution. And the machine's all explosive-proof electric drive motor achieves instantaneous basket speed to insure minimal head fill; a problem commonly associated with air or hydraulic drive motors. Plus, all coating is completed with zero liquid discharge. Specially alloyed cast aluminum lined with steel mesh wire 16" in diameter. Depth is 6". Capacity is 1206 cubic inches. Heavy duty welded stainless steel tank with cover. 3/4 horsepower - explosive-proof spin motor. 8-speed spin motor control standard equipment. 8 increments from 100-600 RPM. 1/2 horsepower - explosive-proof motor for hydraulic lift. State of the art hydraulic manifold technology coupled with our programmable logic controller, positions material tank for load, dip and spin operations and activates spin brake. R-200VPC is equipped with a programmable logic control unit which allows for hands-off operation from the moment the work basket is locked in place until the cycle is finished. The machine will store 16 different timed dip-spin procedures each of which is tailored to your specifications. Maintains capability for manual operation. Additional 16 profile logic modules are available. 20 to 40 cycles per hour with one operator, for most coating operations. 52" width x 48" depth x 67" height. 1300 lbs. Crated 1500 lbs. 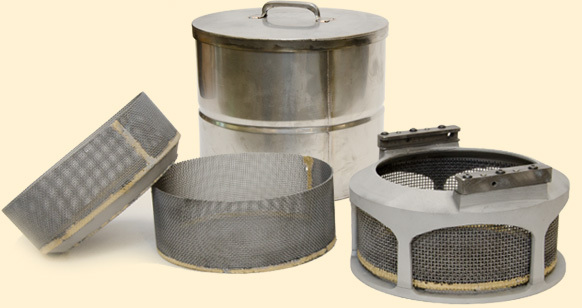 Ronci offers a variety of accessories for our spin dip centrifugal machines, including Removable Bottom Work Baskets, Coating Material Tanks and other replacement parts that extend the life and usefulness of our machines. For more information about our Product Accessories, please send us an email or call us directly at 401-231-8676. Your competition is already using the Ronci machines - thus effectively coating many parts that you may be wastefully spraying - saving them time and money. And while the original Ronci machines will help you speed up production and operate at higher profits, they are among the least expensive on the market. in fact, considering the workload they handle, they will pay for themselves in no time.